Hello, my name is Mrs. Garcia; I was born in Monterey, Mexico but I’ve lived in California since I was a young child. My husband and I have 3 children; now 2 men and one woman, we are also grandparents to 4 children, 2 boys and 2 girls. Prior to working at All Saints’, I completed my education at San Diego City College in early childhood development. 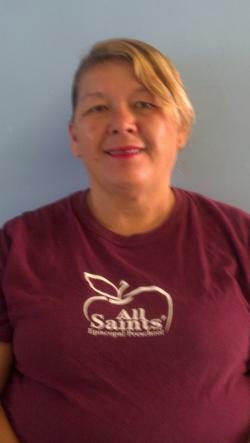 I’ve worked for All Saints’ Preschool since 1991 and have enjoyed every minute of my time with your children. When I’m not at work I enjoy travelling and spending time with my family.